One of our family friends has a beautiful Husky and Lab mix that is great with their children and a wonderful addition to the growing family. While his personality won over their hearts, his digging behavior has left much to be desired. Their backyard, once in pristine condition, has turned into a patchy, holey, minefield-type maze. To their dismay, their dog’s digging has become a problem. Why do dogs dig, and what can be done about it? Does your dog have a digging problem? If so, there are tips you can try to help get the situation under control. By nature, most dogs have an instinct to dig. In the wild, dogs would hunt their prey. If they had an excess of meat, or simply wanted to save their catch for later, they would bury it so other animals wouldn’t come and take their meal. According to Cesar Millan, burying would not only hide the food from other animals, but it would act as the dog’s refrigerator and give it that extra, earthy taste. Today, domesticated dogs don’t need to hunt or hide their food, but that doesn’t mean the instinct is gone. Some dogs will still dig to hunt for prey, and canines might bury favorite toys, bones, or objects they claim as “theirs” that they don’t want others to get to. 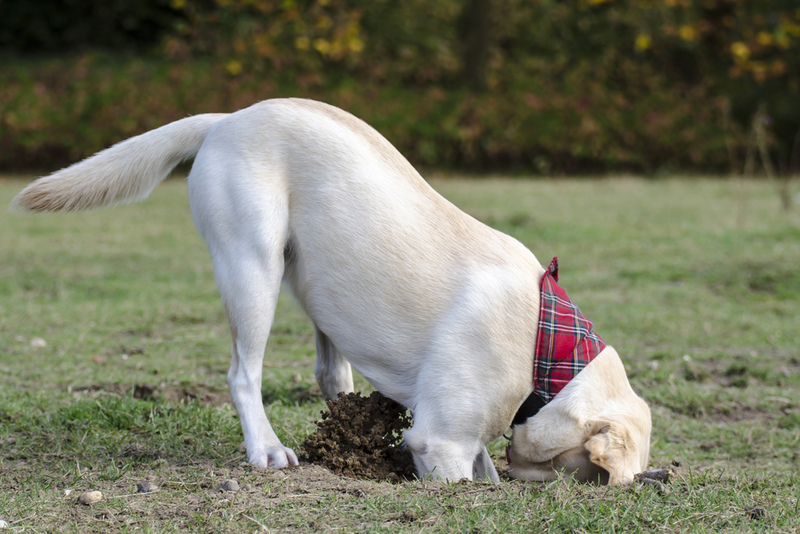 Some dog breeds are more prone to digging than others. Those particularly fond of the activity might use digging as an enjoyable way to get out extra energy. Boredom may also play a role. If your dog feels like he is lacking attention, he might dig in order to get you to play with him. For other dogs, digging may be anxious behavior. While anxiety in dogs can manifest itself in a plethora of ways, digging may be one indication that your pup is experiencing anxiety. If you notice your dog’s digging behavior has gotten increasingly worse lately, consider the amount of exercise he has been getting. Try to go for daily walks or have daily playtime to release his pent up energy. You could even consider swimming, bike riding, hiking, fetch or Frisbee with your pet. Not only is it healthy, but by the time your dog gets home from a long walk or an exciting game of fetch, he most likely won’t be thinking about digging up the backyard, but instead resting for a bit. If digging has been a consistent problem for your pet, he most likely will need your supervision when he’s in the backyard. If you notice your dog digging, simply distract him from what he is doing by making a brief, loud noise to grab his attention. Try clapping your hands, blowing a whistle, or using a shaker can – a can filled with coins or rocks – to get him to stop momentarily. Dr. Wailani Sung wrote on VetStreet that you could then further distract your four-legged friend by throwing some treats on the ground away from the hole he’s digging that he has to search for and find. Other modes of distraction can include complex toys to substitute your dog’s digging. KONGs, for example, tend to work well. If you notice your dog digging, grab his attention and give him a KONG filled with peanut butter or other treats. This will allow him the opportunity to focus on another activity that will occupy his time and still provide him with treats in the end. Of course, monitor the amount of food you give him to ensure he is staying happy and healthy. If the above-mentioned ideas don’t work with great efficiency and your dog is still avidly digging, consider creating a small space where your pet can let loose and dig around. Dr. Sung suggests sectioning off the area with small plants or flags to mark the area. You can even put sand down if you prefer. If comfortable with this idea, try partially burying some of your dog’s favorite toys or treats that he can dig up in an appropriate space. If he begins digging where he is not supposed to, grab his attention and redirect him back to the allotted yard space where he can dig. Thanks for stopping by! We hope you enjoyed this article. Please share it on social media sites, and with friends or family who may need assistance with their dog’s digging problem. I like the balance of explanation about why dogs dig, and the suggestions of remedies to take. All the remedies suggested are appropriate. Most of us can do more than one of these. What I have not done so far, is to make a “digging area” in the yard. I’ll make that my next big step, for our pit bull rescue. OneDayTop has recently posted for PET : While Need to You Supply Your Cat a Bath?